When we meet people we offer our hand for the time-old tradition of a handshake. That first handshake can make or break an early relationship and whilst there are many psychologists who’ll provide insight on every variation of the ‘handshake’ – what’s generally agreed is that a damp and flimsy handshake, aside from being just unpleasant, inspires zero confidence and leaves you questioning the credibility of whoever is on the other end of the hand. 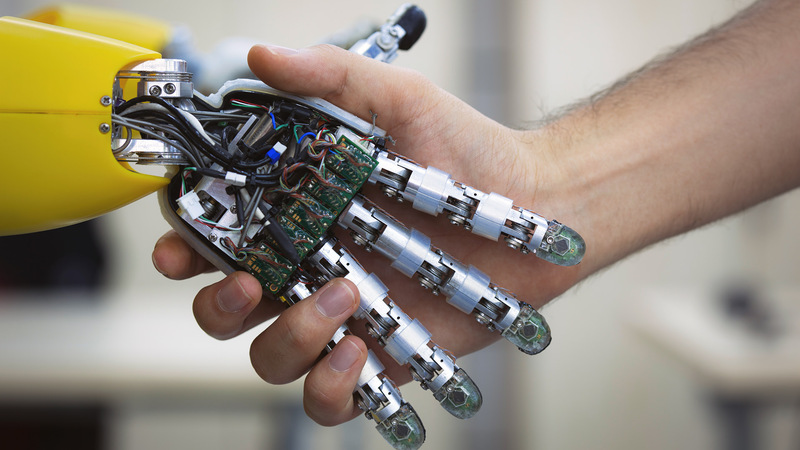 There’s an (online) equivalent to the damp and flimsy handshake. It’s the quiet, discreet and often unnoticeable thank you or confirmation that typically appears in a smallish green or red (default colour) font. These confirmations are often ‘off-brand’ and frequently do not convey the appreciation of the organisation serving them. 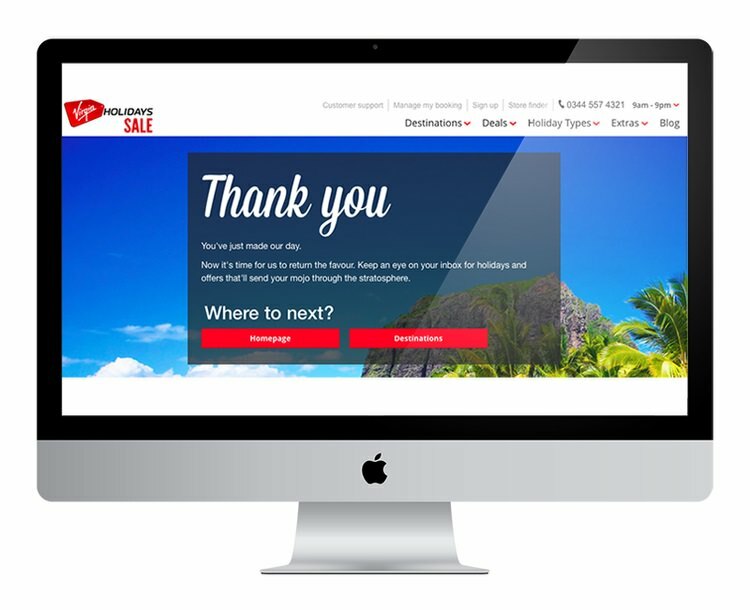 Whether it is a thank you for purchasing, or a thank you for signing up – the message must be clear, confident, on-brand and should (ideally) be accompanied by other information that further builds trust and increases engagement in the brand. The example above is the ‘damp and flimsy’ handshake. 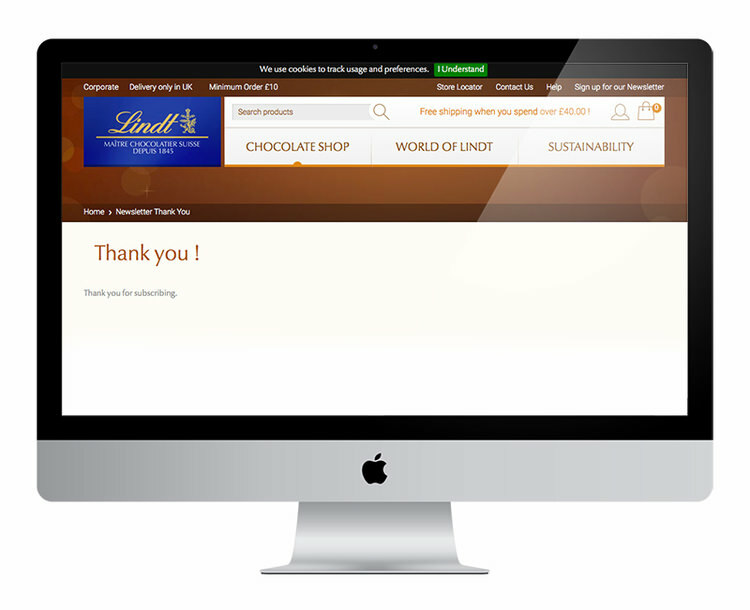 A default thank you from Lindt Chocolate for signing up to their database. Lindt is a leading chocolate brand but they have missed an opportunity here to tell us about their fantastic products or what’s heading in our direction by way of offers and news, or questioning if we have Valentines or Mothers Day chocolates organised. Lindt could be sharing information on their latest product development or telling us their latest news before redirecting us back in to store. Virgin Holidays (above) begin by stating that we have ‘made their day’ simply by signing up. Virgin have boldly thanked us before promising to send us great offers that will ‘send our mojo through the stratosphere!’. This confirmation communicates their brand through tone of voice, it makes promises as to what might happen next and directs us back in to the website to continue browsing and perhaps spending! It’s strong, bold and creates brand engagement.